SE 1995-01 ? kr ? The Sega 32X (スーパー32X) codenamed Project Mars, is a hardware add-on to the Sega Mega Drive created by Sega. It is the second of two major add-ons for the system, the other being the Sega Mega-CD, and was released worldwide in late 1994. The 32X was designed to extend the Mega Drive's lifespan by giving it significantly more powerful 32-bit processing and texture-mapped 3D polygon capabilities. It was thus seen as a logical upgrade to the 16-bit processing and 2D capabilities of the Mega Drive and its main rival, the Super Nintendo Entertainment System. The 32X was succeeded by the Sega Saturn. In the interests of simplicity, Sega Retro uses a simplified "Sega 32X" name for the unit, though the official name differs depending on regions of the world. In Japan, it was distributed under the name Sega Super 32X, in North America, the Sega Genesis 32X, in Europe, Australia and Asia, the Sega Mega Drive 32X, in Brazil, the Mega 32X and in South Korea, the Super 32X. 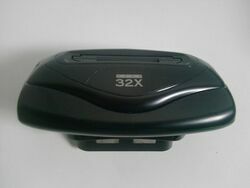 The Sega 32X is a large and heavy "mushroom-shaped" unit which plugs into the Mega Drive's cartridge slot. It was designed to be a permanent addition to a Mega Drive setup (unlike the Power Base Converter), acting as both a means to play specialised 32X cartridges, and as a passthrough device allowing normal Mega Drive games to be played. A provided plastic spacer ensuring it can fit inside most official versions of the Mega Drive console. The Sega 32X plays its own cartridges which are designed to take advantage of the enhancements of the system. These cartridges which will not physically fit in a standard Mega Drive (nor any console produced since), and the setup is designed so as not to interfere with an attached Sega Mega-CD. Like the Mega CD, the 32X cannot function as an independent machine, and therefore always requires a powered Mega Drive to be present when in use. Numerous factors led to the criticism over the 32X, but one of the major issues is encountered before the system is even switched on. The device requires its own AC adaptor, and a second physical connection to the Mega Drive console from the back of the unit. If the user also has a Mega-CD, this means no less than three power adapters are required (plus a fourth for a television). Both the AC adaptor and 32X Connector Cable are bespoke units - the AC adaptor is more common as it is identical to that seen with the Mega Drive 2 (though is not often covered by universal AC adaptors), but the 32X connector cable is unique to the 32X and was not sold separately (though third parties variants exist). As an aside, the 32X's video encoder is of a slightly higher build quality than those usually found in later iterations of the Mega Drive, potentially resulting in a slightly clearer image when playing Mega Drive titles. Furthermore, Sega's AC adaptors of the day were designed so that the transformer was located around the plug area, resulting in several bulky units obstructing surrounding sockets. Due to the extra space required just to plug the console into the wall, Sega eventually released their own Sega Power Strip in North America. The 32X brings significant visual upgrades to the Mega Drive with inclusion of a 32X VDP, allowing the machine to display up to 32,768 on-screen colours (versus the usual 64 seen in Mega Drive titles) and render more 2D sprites at any given time. Combined with an added two Hitachi SH-2 32-bit RISC processors (also used for the Saturn), it is better suited to 2D scaling and rotation, and is capable of rendering texture-mapped 3D graphics. Audio capabilities were also upgraded, including the addition of a PWM audio chip offering extra sound channels and QSound technology, enabling multidimensional sound that allows a regular stereo audio signal to approximate the 3D sounds heard in everyday life (similar to binaural recording). The 32X is compatible with the Sega Mega-CD, allowing the user to play one of six enhanced Sega Mega-CD 32X games. Its ability to access a wider palette of colours allows for higher quality full motion video than a standard Mega-CD, whose FMV games are in turn often derided for their lack of colour and detail. Contrary to popular belief, the Sega 32X doesn't employ any regional lockout technology per se, instead relying on the region of the Mega Drive to determine the region of the unit. It does however have a set Genlock frequency which stops 50Hz (PAL) games from working on 60Hz (NTSC) units and vice versa. Due to the 32X only differentiating between frequencies and not region, the Japanese Super 32X and Genesis 32X are identical, and will work on either NTSC console. Much like region modifications on the Mega Drive and Saturn, this is easily changed with slight modifications to the unit, allowing for universal support of all games. North American marketing pitched the 32X as being 40 times more powerful than the Super NES and 6 times more powerful than the 3DO. This was referring to CPU performance, as the 32X's dual Hitachi SH-2 are capable of processing over 59 MIPS, compared to the Super NES's Ricoh 5A22 which processes up to 1.5 MIPS and the 3DO's ARM60 which processes about 9 MIPS. In terms of 3D polygon performance, the 32X is theoretically capable of rendering up to 160,000 flat-shaded polygons/sec and 50,000 textured polygons/sec. In comparison, the 3DO renders up to 20,000 textured polygons/sec, while the Super Nintendo's Super FX 2 cartridge enhancement chip renders up to 4,000 flat-shaded polygons/sec and 2,000 textured polygons/sec. This means the 32X can render up to 40 times as many polygons as the Super FX 2 chip and more than twice as many textured polygons as the 3DO, theoretically. However, the 3DO has math and video coprocessors which take the load off the CPU, whereas the 32X's lack of a 3D coprocessor means it has to rely solely on the CPU to render the 3D graphics. Thus, in practice, the 32X is not much more powerful than the 3DO, contrary to Sega of America's marketing claim. Compared to other non-Sega systems at the time, the Atari Jaguar renders 10,000 textured polygons/sec, while a Pentium 60 PC renders 30,000–50,000 flat-shaded polygons/sec and 6,000 textured polygons/sec,. Meanwhile the Pentium 66 renders 3.6 MPixels/s (the 32X has a theoretical peak of 18–36 MPixels/s). Compared to the Sega Saturn, the 32X is very limited, with part of its graphical prowess depending on the Mega Drive hardware it sits on top of. In the majority of games, the 32X works with the Mega Drive to produce an image, to the point where without the connector cable attached, games will still run and may even be considered playable. The 32X side is able to output up to 32,768 colours on-screen at once, but it is comparitively slower at rendering a full 320x224 image in this mode than the Mega Drive can with its 64 on-screen colours. As such, it is common to see 32X games rely on the Mega Drive hardware to draw large, detailed backgrounds or foregrounds (Chaotix, Tempo, Mortal Kombat II). With the 32X side able to pick up some slack in terms of graphics processing, more colours can be reserved by the Mega Drive for this purpose than in the average Mega Drive-specific game. This hybrid approach was used by many developers to ensure a full 60 FPS refresh rate in 2D games. Games which opt to swap the pipeline around - giving the 32X the bulk of the 2D rendering and have the Mega Drive fill the gaps, are often left with slower frame rates (Pitfall: The Mayan Adventure, Brutal Unleashed: Above the Claw), though there are rare exceptions (Kolibri) that manage to display high colour graphics at 60 FPS. The ability to fall back on the 16-bit hardware, however, can put the 32X at an advantage over systems such as the Atari Jaguar which is known to befall similar frame rate issues when tackling 2D games. Similarly the 32X adds a two channel PWM sound chip, intended to complement the existing Mega Drive audio capabilities rather than replace them outright. This means in many cases, the quality of 32X and Mega Drive audio is virtually identical, with some developers failing to make use of this new chip at all. Main article: Sega 32X cartridges. Main article: Sega 32X/Technical specifications. Main article: History of the Sega 32X. Main article: List of 32X games. Games marked with asterisks(*) are enhanced versions of previous Sega Mega-CD-only games, taking advantage of the 32X's improved graphics, which require both the 32X and Mega-CD in order to be played (see Sega Mega-CD 32X). Main article: Sega 32X/Magazine articles.